Auguste Cain was a versatile sculptor that produced decorative objects including plaques, candlesticks, and trays along with his sculptures. Bas relief plaques were quite popular in the 19th century and were used as wall hangings and as decorations on clocks and furniture. This fine 19th century bronze plaque shows a pair of Pheasants as they forage in the woods. It is mounted in the original wooden frame which is 2 inches wide, and the total framed size is 12 1/4" by 7 5/8" (31 cm by 19.3 cm). 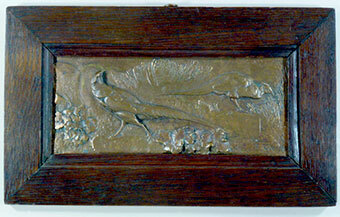 Game Birds have been shown in art of hundreds of years and this is a handsome plaque that would look well in any home.